I just installed 4 Hydra 52s over a 225. They are about 14 inches above the water level and the tank is 30 <inches?> deep. I am running them with the Apex controller which enables me to select between a number of Kelvin temps utilizing the lighting wizard. In your opinion, would it be a good idea to cycle the lights through each of the Kelvin temps as the day progressed? Would this be similar to the way corals receive light temps throughout the day in the ocean. IE) 20k at 7 am, 18k at 8am, 16k at 9am,14k at 10am, 12k at 11am mad 10k at noon. I would stay at 10k for two hours and cycle back to 20k in the same fashion so that I would be back at 20k at 6pm. Or is it better to leave the lights at one color temp throughout the photoperiod. utilizing the lighting wizard. In your opinion, would it be a good idea to cycle the lights through each of the Kelvin temps as the day progressed? at 11am mad 10k at noon. Several years ago now, as I was setting up my fish holding tanks, and system for my LFS, I had a lot of advice from Bob, ( and great advice too ), for which I am so grateful. My system has been running for 8 years now, with great results. It is in 3 tiers, and 3 walls of the large room. The entrance wall is completely open ( no windows), letting in plenty sunlight. The background of the tanks is black, as are the acrylic dividers to separate the fish. In my opinion, plenty light for viewing, but I do not use any added lighting for these tanks. My thoughts were that an environment like this would be less stressful to the fish, and I was told by an exporter that this would also have positive benefits regarding potential parasitic cycles etc. or better if each tank is fully lit? Hey crew, I had a questions about aquarium lighting. After searching your site I could not find exactly what I was looking for. I'm aware about how many watts per gallon of lighting is needed for reef tanks. On the other hand I was curious if you can use a lumens per gallon formula instead? The reason I ask this is because some manufactures only say how much lumens the lighting gives off. I'm assuming lumens are more accurate than watts because watts is only the amount of power is need to run the lights. As always thank you for your time and advice. because I'm planning on adding some things to my tank that I suspect need more/different light than what I have. I'm just starting on this process, but I so very much appreciate your great articles and disambiguation on the subject. Still reading, reading, reading for now, and will move on to buying when I'm ready. > the various means of lighting your system(s). > greater are called for. and one bona fide correction came up, with one possible correction. First, in "quality of light is it's *composition*" you got the wrong version of its/it's. I wouldn't have written over such a small thing, but the second thing prompted me to write. Did you intend to repeat the last sentence three times? I've seen that sort of thing done for emphasis, but usually there's some indication that that's what's happened, e.g. : the repetitions are capitalized or punctuated more forcefully. The repetition looked more like a copy and paste error than an intentional repetition for emphasis. Thanks again for a fantastic website, and an amazing resource. I hate to criticize when I'm not perfect myself. I have been researching this for a little while now, and I have some answers, but not what I need to make an informed purchase. I am currently in the process of purchasing the equipment required for a 75G reef tank. I currently have: 75G tank, reef ready w/glass top and overflow plumb kit. I'm in the process of researching my lighting requirements, and have been getting conflicting information, and IÂ¹m hoping someone with your expertise can help me. I'm looking to set up a reef tank with fish, inverts, corals and an anemone. My tank is 48'x18'x20' dimensionally. I am leaning towards a pendant MH system, 175W, 14000K (two of them, actually), but have some questions. Firstly, will this be enough light for an anemone and some soft corals? Second, do I NEED actinics, or will the result be purely aesthetic? Third, I'm thinking I might just go to 250W's to save myself the trouble of having to buy them later...will this be too much for the anemone (or everybody else in the tank, for that matter)? Will it 'burn' the animal (as I've just been told by a LFS...who also told me that I 'wasn't doing my research', that 'anemones don't require a lot of light'). Can I get by with 48' T5's (2 x 10,000K, 54W and 2 x Actinic 420nm)? Somehow, I suspect it won't be enough. I just want to make sure I am purchasing the right system for the animals, both to keep them happy, and to minimize the trips to the store! You folks are providing an invaluable service to us, especially novices like myself. I had previously read the lighting article you pointed out, however it has made me even more curious about the use of full-spectrum vs cooler (say 16k+) lighting for reef tanks. Something I've noticed while reading up is that there seem to be two competing approaches, namely "when in doubt, go with full-spectrum...it's best to emulate natural sunlight as close as possible" vs the school of "the primary light the zooxanthellae need to photosynthesise is in the actinic band, and the reds and yellows get filtered out so quickly, so rather focus your efforts on throwing more blue light at them". And I've come across very good examples of both approaches, used on similar species, where the results have been excellent. 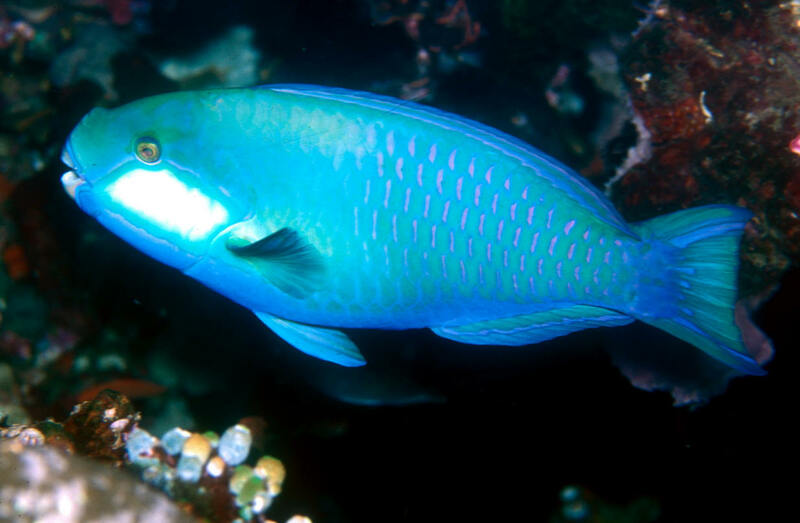 I thought I'd settle the argument by looking at what coral breeders use, and I must admit that from what I've found out there seems to be a tendency to go more with full-spectrum lighting. I assume that this is a part of the industry you would certainly know more about than I do, so what is your experience in this area? I've also read a couple of articles (though none from what I'd consider to be totally reliable sources) which have suggested that high levels of red light have been linked to recession in some species. My personal interpretation of the many conflicting reports tends to lead me down the path of 5.5k-10k for species found in shallower water and 16k - pure actinics for species found in deeper water; however I thought I'd put this up for an opinion. Oh, and just to add one more thought to the mix there is my own confusion from diving on the barrier reef...I've seen very similar-looking species (though I guess you can't always tell the exact species by visual inspection only) of Sarcos and Acroporas growing equally prolifically from 5m of the surface, right down to 30m where there is little of anything else but blue. So there it is...any assistance or clarification greatly appreciated. It doesn't take tough times to want to save money... to spend less and get more. for the buck" and appreciate when we can do it with good conservation habits in place. With the inception of each product at IceCap Inc., superb energy efficiency is an integral part of the design. Our products are category leaders, often by huge margins, for energy efficiency and longevity. For example, the IceCap 660 and 430 electronic ballasts operate at up to 40% greater efficiency than competitive ballasts. As such, with greater light produced per watt consumed, you will need fewer lamps to accomplish the same task. And with less lamps used, less money is spent on replacement lamps and ongoing operating expenses. - more efficiently - and can pay for themselves with savings in as little as 36 months. The list goes on... and grows! Rely on IceCap brand products to save energy and save money. Lighting/Maintenance 1/27/06 Hi Crew, <Hello Mohamed> If one has a light meter and the PPF reading is e.g. 750, after some time the tube losses value and it reads e.g. 550 when must the bulb be changed? Is there a rule? E.g. if the light losses 20% of the PPF value than it must be replaced. etc <Rule of thumb is to change lamps on a yearly basis. If this light meter is submersible than water clarity can have an effect on the reading. If it were me, I'd take a reading with the sensor directly under the lights (out of the water), record your reading and if the value dropped more than 10% down the road, I'd change the lamp(s). Obviously you would want to take this initial reading when the lamps are new. Thanks <You're welcome. James (Salty Dog)> Mohamed. Re: Lighting 1/7/06 Thank you for the reply. I guess I was too long winded before, if I had 10k bulbs, would that light be brighter then the 440 VHO I had previously. Thanks for being there for everyone in need. Thomas <Welcome. The 10k's should be fine here. Bob Fenner> Re: Fighting over lighting 01-03-06 Hello again---and thanks for your thoughts. <Glad to help.> If I buy a retrofit kit, would I need to build a fan into whatever I was building? I don't have a canopy on my tank so I would need to build a box, correct? <Yes, or hang a pendant.> I am sorry to sound stupid, but I am not really handy with tools!!! What are the best materials to construct a housing for a retrofit kit? <If you are not handy it may be best to use a pre-built lighting setup. They come in nice cases with fans. If you really want to build a canopy, make it out of hardwood, like oak (less likely to warp, and use marine spar varnish (find it at Home Depot) to finish/seal the wood. Travis> Thanks again!! Mark Heat from lighting - 1/3/2005 Dear Crew, How can I tell if my light fixture is getting too hot inside the canopy? This is my setup: 58 gallon glass aquarium with glass cover & wood canopy. I have a Coralife power compact AquaLight with 2- 96 watt bulbs sitting directly on the glass top - it has one fan I am concerned that the light may become too hot when the wood canopy lid is closed. it is an oceanic canopy that has the rear panel cut out, there is about 4.5 inches of room (depth) inside for the light. Is this a typical set up or do I need to add an additional fan inside the canopy? <If the bulbs are in their original fixtures, and the water temperate is not significantly affected, I would not be overly concerned here. If temperature escalates in the summer, consider running the tank open-topped without the glass cover. Best regards, John> thanks Kim 44 Gallon Lighting Issues 12/30/2005 How are ya'll doing. <Okay, thanks> I would like to personally congratulate myself on owning the most obscure tank in the universe. I managed to pick out the worst possible shape for a tank its a 44 gallon perfecto corner tank. Never mind that it had the oddest dimensions, but worse yet, its incredibly deep, two feet. I'm only 5 feet tall, so I practically go swimming when I have to get to the back corner of the tank. <Good point> I've searched high and low for these answers and I can't find them. The highest wattage I can place on my tank is 80w [two 40 watt compact bulbs]. However... I'm somehow going to fandangle my way into a glass top, I do not know if these are manufactured or not, I've yet to find one. <You can/could make one...> If I can do that, I can get two 24" compact fluorescent bulbs on top of it, which still only brings me up to a whopping 130w. My question is this. 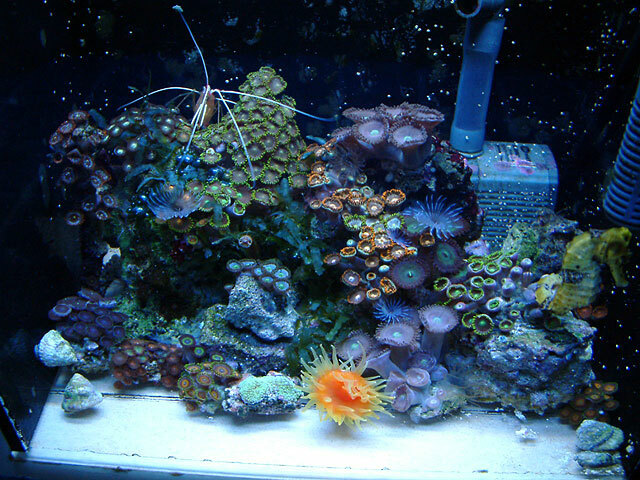 If I only intend to place my specimens [either coral or anemone] within the top 12" of the tank. Is there adequate lighting. Or should I just give up on the idea of a reef tank and do fish only? <Good question... if it were mine, I'd look into a pendant type metal halide for this tank... concentrate the higher need photosynthetic invertebrates there. Bob Fenner> Lighting and Coral mixing questions Gentleman, <And a few gentle ladies> Love the Wet Web Media website but was having problems logging on to ask questions so I figured I would take this approach. I have a 90 Gallon reef setup with a 25 gallon refugium (I realize that it is a little small but am planning an upgrade). Essentially I have two questions for you. 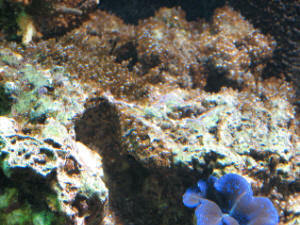 First, I have mostly soft corals with very few hard but would like to go with some SPS. Currently the tank has the following animals: 1 very large Hammer (12" high, 14" long, 6/8" deep) 1 medium Frogspawn 3 colonies of Star Polyps 1 large Toadstool (8" in diameter) 1 small colony of Zoanthids 1 large Finger Leather 1 medium Green Tree Leather 1 small colony of Red Sea Xenia 1 small colony of unknown Xenia 1 small Clam 1 small Galaxy <Keep space around this... a good six inches> 1 small Blastomussa 1 small Kenyan Tree 1 Large colony of roughly 50 Mushrooms 1 6" diameter Merulina 1 medium Maze 1 small unidentified brain 1 small encrusting Montipora a dozen mixed fish <Wowzah!> My question is, is what would I need to remove/trade to change over to a SPS tank in your opinion? <I would not add these here period> Secondly, I have a PFO VHO setup that has 440 watts of lighting. I am wanting to upgrade to a PFO MH setup with 2 175 watts fixtures. I also have a 130 watt power compact setup I was thinking of adding in addition to the MH. Are the MH's going to be too much with my current setup and or enough lighting if I went with a SPS reef? <Should be fine. I would wait on this switch out... till you have your other tank> Do I need to add the PC's to either reef setup or is this overkill? <Could add... I would if I had otherwise not in use> Last, what Kelvin rating would you recommend for the MH's for each setup? <Tenk Kelvins> I know there is a lot of questions but I certainly appreciate you time, energy, website, and attention to these questions. Have a great Holiday! Sincerely, Greg Watts <Success to you in your new and existing systems/adventures. Bob Fenner> Lighting question Happy holidays Wet Web Media crew!!! <And to you Jeff> I am thinking of upgrading the lighting in my reef tank. I have a 110 gallon custom made tank that is 30" high, 48" wide, and 20" width. I currently have only a 36" PC hood with 2 96 watt PC's. I have a 36" on a 48" because the tank came with a matching canopy, which I never use, and a 48" hood wouldn't fit if I ever decided to put the canopy on. My system is over a year old, and I predominantly have leather corals (toadstool mushrooms, various colts, 2 Goniopora, button polyps, etc.) I also have a clam at the bottom. Everything is doing great, and the leathers are all growing nicely. 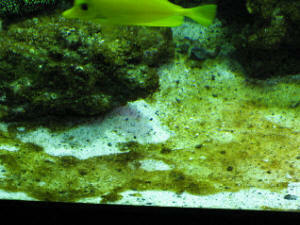 <I am surprised that everything is doing OK (especially the Goni) with just 200 watts of lighting on a 30" deep tank. Must be receiving a good amount of indirect lighting.> I am thinking of upgrading my lighting to metal halides or a MH/PC combo hood. My question is this: how many watts for my hood should be good for my tank. <With that deep a tank I'd have to say three 150 watt HQI's but my question is how long have you had the corals?> I've looked at one hood that has one 250 watt MH and 2 96 watt PC's, or a hood that has one 150 watt HQI MH and 2 96 watt PC's. Or there is a hood that just has 2 150 watt MH HQI's 20,000K but no PC's. <Yes, the SunPod HQI 36" hood has two 150 watt HQI's <14000K> and six blue/six white LEDs.> Are the HQI metal halides that much better than the older models of metal halides??? <Yes, I like them better. I believe they are more efficient. HQI (High Quartz Iodide is a little different than the MH High Intensity Discharge lamps. They are both system specific, that is a HQI ballast is not going to fire up a MH bulb and vice versa.> I am thinking of adding some Acros to my tank as well. <You will definitely need HQI/MH for these corals.> Thanks for your advice. <You're welcome. James (Salty Dog)> Sincerely, Jeff. Re: Lighting question 12/30/2005 OK, one more quick question. The SunPod comes with 14,000K bulbs. What kind of lighting appearance will this give throughout the tank compared with the 2 PC's I have now (1 is actinic, 1 full spectrum). <It's going to have a slightly more bluer appearance and the HQI's will produce a shimmering effect, very pleasing.> And, if I got 2 different spectrum HQI on a 36" SunPod, would you see much of a difference on each side of tank, like one area being more actinic than the other, or would the 2 sort of blend throughout the tank. <You would notice a difference but you don't want to do that, keep them both the same. Here is something you can read concerning lighting. http://www.wetwebmedia.com/marlgtganthony.htm James (Salty Dog)> Thanks again. <You're welcome> Jeff.